At the beginning of the fall 2017 semester, the walkway between the Student Center and science building became blocked off by fences. 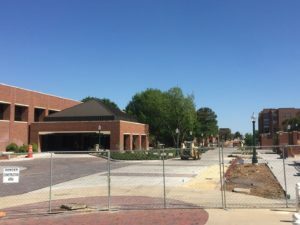 This next phase in construction on Tarleton State University’s campus created different pedestrian routes, with students unable to enter through the west entrance doors and unable to walk in between the Student Center and science building. The Texas A&M University System manages over the walkway project which was originally announced to be finished back in February. Throughout the past 18 months, several extensions have been needed due to inclement weather. During a recent Texan tour, a walkway was open from the west entrance of the Student Center to the front of Heritage Hall and Legacy Hall. “Construction takes place on weekdays only, the university was able to open the walkway temporarily for the weekend of Texan Tour,” said Cecilia Jacobs, interim vice president for Marketing & Communications. After the Texan tour, the walkway was blocked off again for safety reasons with the ongoing construction during weekdays. The spring 2018 semester is coming to an end and the walkway is still under construction. Jacobs says the walkway opening is weather permitting and will open permanently in May if not sooner. Entrance to the west side of the Student Center has been reopened as of May 1. The upcoming project priorities for fiscal year 2019 are currently being finalized. The next upcoming project under construction by the end of the year will be the Agriculture & Plant Center at College Farm.